Alright, faithful readers. I’m back with a not-so-weekly recipe, but it’s guaranteed to be a crowd-pleaser. I was a bit shocked when I realized how much time had passed since my last recipe post, but then I remembered: for the last four months, I’ve been experimenting with gluten-free and dairy-free diets in the (ultimately futile) hope they would minimize or eliminate my migraines. No such luck, but through that process I discovered how many of my Maine cookbook recipes heavily feature dairy (because let’s be honest, it’s delicious). I was also pleasantly surprised to discover that aside from difficulty at restaurants, eliminating gluten and dairy really wasn’t that hard, and I didn’t miss it that much. Now that I’m back to an unrestricted diet, it’s time to get back to regular recipe shares. Mom’s Best Brisket comes from my all-time favorite Maine cookbook, Recipes from the Maine Kitchen. It fits my low-maintenance cooking and entertaining requirements: brief ingredient list, relatively straightforward, and delicious results. I made this on Saturday while we were entertaining a few friends and watching college football (Go Tigers! ), and it was a hit. For the best flavor, you should really make it the day before…. but I ran out of time. 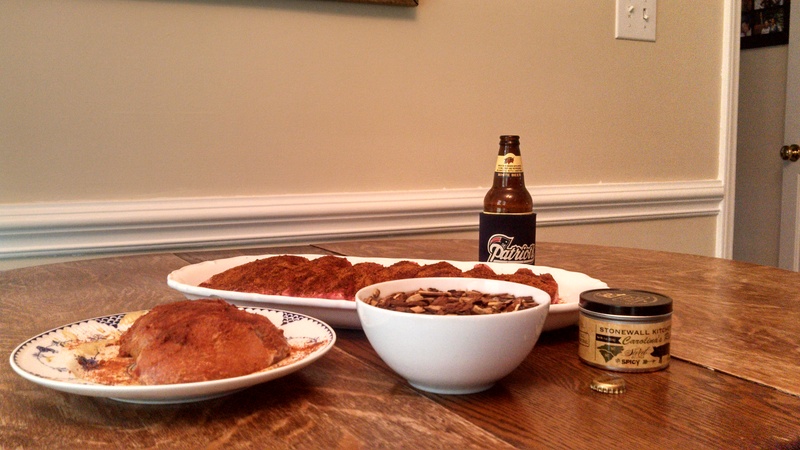 Brown the brisket on all sides in a heavy skillet or large Dutch oven. Remove brisket and put on a platter, then brown the onions and garlic. Add the remaining ingredients and place the brisket back in the pot. You can either cook the brisket on the stove top over a low flame for 2 to 3 hours, covered, or put it in the oven, covered, at 325 degrees for the same amount of time. At 2 hours, check the meat – if it is tender but not falling apart, remove the brisket and place on a large cutting board. Slice the meat across the grain in 1/2 to 3/4 inch slices, return to the pot, cover and continue cooking for a half hour to an hour. This step is messy but is worth it! The flavors really seep into the meat this way. I served the brisket with a salad and garlic couscous, but mashed potatoes would also be an excellent side. Categories: Eat, Weekly Recipe | Tags: brisket, home cooking, recipes, Recipes from the Maine Kitchen | Permalink. After two months of gluten-free eating, I can scarcely express how excited I was just to toss myself into a chair at our local watering hole on a Friday night and enjoy a beer. Nirvana. While my local watering hole these days is far from Portland, Maine, I’m no less enthusiastic for you lucky ducks who have a chance to experience Portland Beer Week – a mere six (yes, 6) days away! 2015 marks the 4th annual event, which runs from Sunday, November 1st – Saturday, November 7th. Rising Tide Tap Takeover at The Great Lost Bear: Sunday, 11/1 at 5pm – a must do! Cider Night at The Thirsty Pig: Tuesday, 11/3 at 4pm – I enjoy a good cider nearly as much as a good brew! Allagash Mega Bash at The Great Lost Bear: Friday, 11/6 at 5pm – two Maine powerhouses come together! Old shot: Enjoying a Maine craft brew – Allagash White – while supporting my Pats… and prepping for a cookout! Those are just my top picks – there are many incredible options… and you can tell things get especially “thirsty” on Thursday. Attend one or many, but get out and about and enjoy this booming part of the local economy! 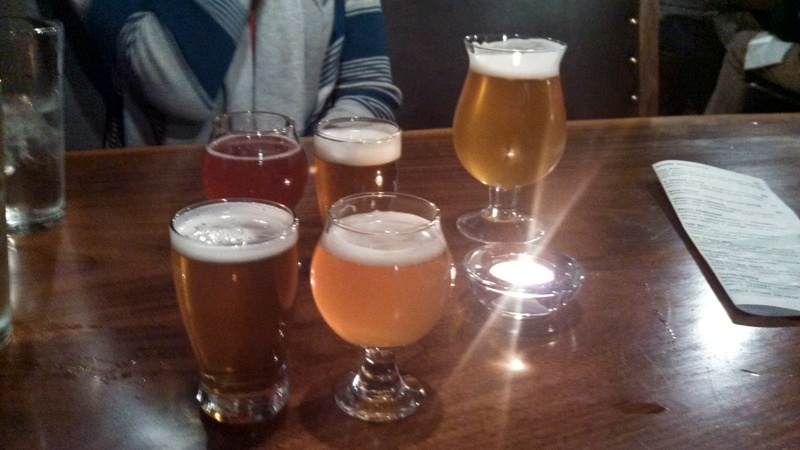 Categories: Drink, HoME Grown, Play, Shop | Tags: breweries, craft beer, Maine, Portland Beer Week | Permalink. Harvest On The Harbor – Starts Tomorrow! How did the middle of October get here so quickly? That seems to be the theme of the year for me – it has simply flown by and I find it hard to believe we’re well into fall, harvest, and foliage season. Get out and enjoy all the city and the state has to offer! Categories: Drink, Eat, HoME Grown, Shop | Tags: beer, entertainment, food, foodie, Harvest on the Harbor, Maine, music, Portland, wine | Permalink. My third and final installment in the Wine in Maine series is here! When people think of wine in Maine (anyone who’s flipped open a Maine-based magazine, at least), it’s highly likely that Cellardoor is the first thing to come to mind. Glossy advertising will do that, especially without much noteworthy competition in the state. 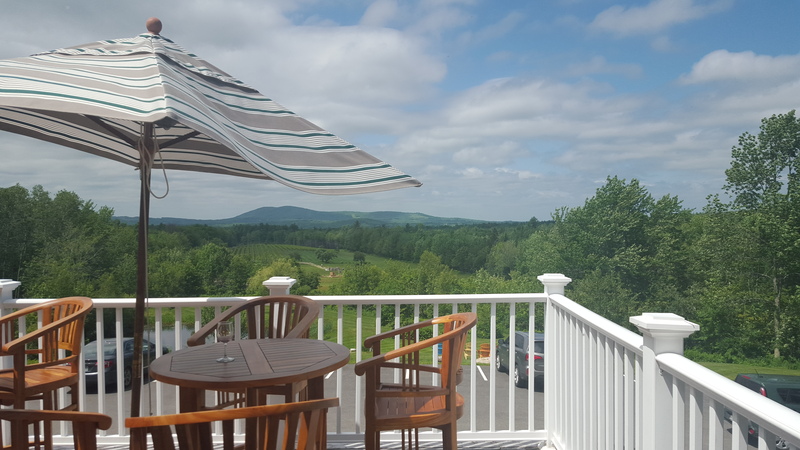 Having now visited Cellardoor in person, it is easy to see the appeal of this winery – it combines a picturesque view with quality wine and an atmosphere that, at least on the surface, is representative of the great state of Maine with rustic touches, coastal elements, and a general sense of welcome. On the day of our visit, as we wound our way from Union to Lincolnville, I was filled with anticipation to see the business that has been clearly established as the preeminent Maine winery and wine destination, down to their very website URL, mainewine.com. In many ways, I was not disappointed. The visual experience both indoor and out at Cellardoor is stunning – a beautiful facility with a smart and attractive selection of merchandise, combined with a sweeping view. I struggled with writing my review of this winery because I recognize how many of my readers, and consumers in general, may love the Cellardoor experience. I simply didn’t – something was missing for me. I struggled even more, having read the Cellardoor website and chatted with the staff, because it is clear to me that the business owner, Bettina Doulton, is deeply committed to sharing her love of Maine and has played a leadership role in advancing and promoting the Maine wine industry, founding the Maine Wine Guild and its statewide Maine Wine Trail. Undeniably, these contributions are heartfelt, genuine, and critically important to the state’s wine tourism industry. I admire her mission, what she has accomplished, and the business she’s built. So what was missing for me? It’s hard to put my finger on. It is some intangible combination of the people, the wine, and the atmosphere that gives those businesses that capture it a very special quality and deeply resonates with their customers. It feels natural and unrehearsed. I love those special Maine businesses that feel deeply authentic even to the point of imperfection. Cellardoor was stunning – so stunning and manicured it struck me as somehow more suited to Cape Cod or Martha’s Vineyard than Lincolnville, Maine. I was reminded of how I felt during my college tour on the Furman University campus – rather like a bull in a china shop, as they say – certain I would break something in all of that pristine beauty. So, candidly, it could be just me. I am confident the vast majority of patrons enjoy every moment at Cellardoor and reminisce about their experience with family and friends. And while I am charmed by the meaningful history behind the Cellardoor logo, I simply found Cellardoor to be somewhat… remote. It was beautiful. The wine was good. Our server was friendly and personable. It just didn’t feel like the small businesses Maine is known and loved for, where the owners are omni-present, the employees are more ambassadors than mere workers, and the appearance and experience may not be flawless, but it is human and warm. Having said that, I do want to share what I did enjoy. First, I was really impressed by the merchandise Cellardoor chooses to stock – it is a classy and appealing mix of glasswork, art, pottery, books, and wine and kitchen gizmos. Where some wineries dip dangerously close to chintzy, cheesy gift items, Cellardoor has a selection that would have me stopping by just to shop for something beautiful and unique. Second, the wine was certainly well-crafted, and made from grapes grown across the country as well as Maine, which enables Cellardoor to offer varietals that more people are familiar with (such as Cabernet Sauvignon, Chardonnay, and Syrah, among others). This is a smart business move and, very likely, enables the owner and winemaker to craft wines they themselves already love. I particularly enjoyed ‘Ned Said Red,’ a blend of Cabernet Franc and Merlot with a naming back story. 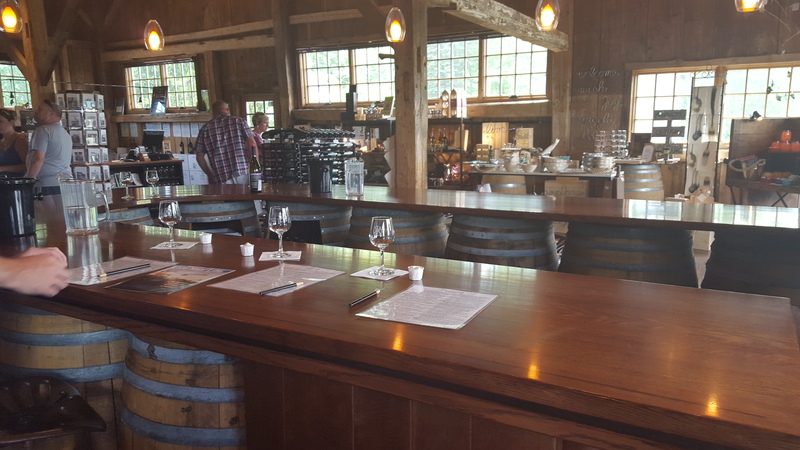 The facility includes a restored barn and farmhouse (the tasting room is located in the restored barn), as well as a state-of-the-art winery across the road. It has been beautifully redone with high quality finishes, and in combination with the view, would be an incredible and romantic setting for a wedding or other type of event. 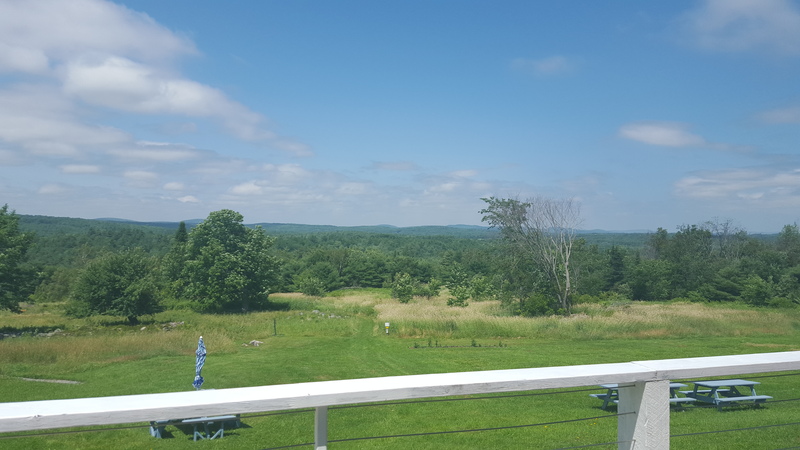 If I visit again, my advice to myself is to appreciate Cellardoor for what it is, grab a glass of wine and a seat on the porch, and soak in the beauty of Maine. Categories: Drink, Eat, Play, Shop | Tags: Camden, Cellardoor Winery, Maine, tourism, wine | Permalink. There’s so much to love about fall – pumpkin-everything, vibrant colors, lovely weather – and all of the many family-friendly, educational and/or entertaining fairs! Enjoy this one, or find a local fair near you! 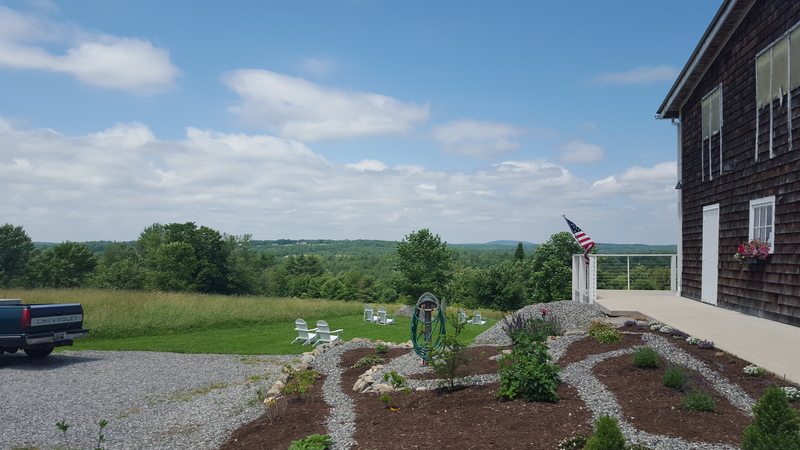 When I think about our visit to Sweetgrass Farm Winery & Distillery, the image that instantly pops into my mind is that first moment, as we pulled into the gravel driveway and had our first glimpse of a sweeping view of field, forest, and mountains. The driveway itself is edged closely by both the road and the winery, as so many other old farms now are – pressed up against our modern roads. The winery structure is charmingly, classically Maine. A pretty, shingled building that has been updated to combine traditional elements with other, more modern influences like the wraparound deck and railing. I found this combination of styles to be a theme throughout Sweetgrass – and it’s been executed so seamlessly that it enhances the experience without feeling too “perfect” or “untouchable.” Inside and out, from the restored old truck and the gleaming copper Alembic still to the classic, white Adirondack chairs on the lawn, Sweetgrass hit all the right notes. “Sweet” indeed. Philosophy and setting aside, the wines and liquors we had the opportunity to taste were exceptional on their own. While my favorite, by a large margin, was their apple wine – delightful and crisp and pairs beautifully with lobster – I also enjoyed the sparkling cranberry apple (after all, what could be more holiday-appropriate than this flavorful, bubbly treat?) as well as the rhubarb smash. Nick particularly enjoyed their renowned Back River Gin, which ended up being one of three bottles we purchased and brought home with us. During our tasting, we had the opportunity to chat a bit with one of the owners about the business and what they’ve strived to accomplish. I walked away understanding that vision, experience, and commitment have been critical to their success, which now includes an Old Port location and many accolades and awards, in addition to the Farm itself. From beginning to end, this is a must-visit Maine winery. It was just our second of three winery stops during our cross-Maine trek from Crescent Lake to very nearly the Camden area, and it is the one I would most like to visit again. Next time, though, I’d pack a picnic lunch, plan to stay a while, and indulge my wish to sit in one of those Adirondack chairs, soak in the view, and sip a Sweetgrass wine. That’s how I recommend you experience it! Categories: Drink, HoME Grown, Play, Shop | Tags: Gin, liquor, Maine, Maine wine, Portand, Sweetgrass Farm Winery and Distillery, Union, wine | Permalink.